Dubai, UAE, March 23, 2019: Invest Northern Ireland invited Al Maya Group to visit Belfast in Northern Ireland and arranged meetings with leading companies dealing in FMCG / Food products. The visit of Al Maya to Belfast was the follow up on last visit and also after the Gulfood 2019. Al Maya's delegation was headed by Mr Kamal Vachani, Group Director. 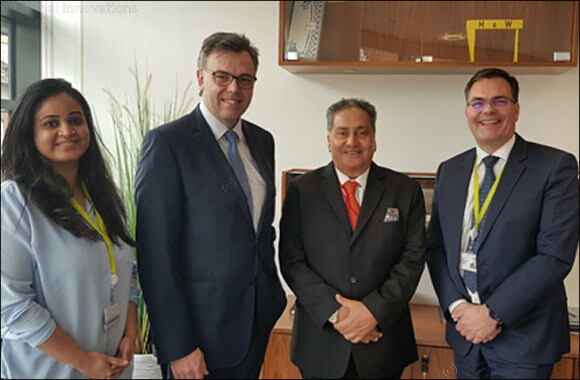 During the visit of the delegation Mr Kamal Vachani also met Mr Alastair Hamilton, CEO, Invest Northern Ireland and discussed the ways to enhance business relations through Invest Northern Ireland with Al Maya Group. Invest Northern Ireland is involved in promoting trade between the two countries. We are very much delighted to be associated with Invest Northern Ireland who has given us an opportunity to interact with leading Northern Ireland companies' informed Mr Kamal Vachani. During the meeting with the Companies, huge business interest has been generated and the NI companies are keen to launch new products in the UAE. Al Maya Group has offered full cooperation to Invest Northern Ireland in importing goods from NI companies and continues to have better business relationship with the companies, informed Mr Kamal Vachani, Group Director, Al Maya Group. Northern Ireland was recently awarded the “World's Best Food Destination” award at the prestigious International Travel and Tourism Awards in London. Al Maya Group has completed over 35 years of operation in the Middle East has become one of the largest and leading FMCG Distribution companies in the UAE. Further, the Group also has distribution of FMCG business in Bahrain, Oman & Kuwait.